Starring: Ralph Fiennes, Gerard Butler, Brian Cox, Vanessa Redgrave, Jessica Chastain, James Nesbitt, Paul Jesson, Lubna Azabal, Ashraf Barhom, Dragan Mieanovie, Jon Snow. As a personal rule, I don’t watch adaptations of William Shakespeare’s works unless I’ve read the play beforehand. I like to have a frame of reference when it comes to the bard but in this case, I capitulated and couldn’t resist putting the film off any longer. I’ll always wish that I had found the time but that doesn’t diminish the overall quality or power of this interpretation from first time director Ralph Fiennes. 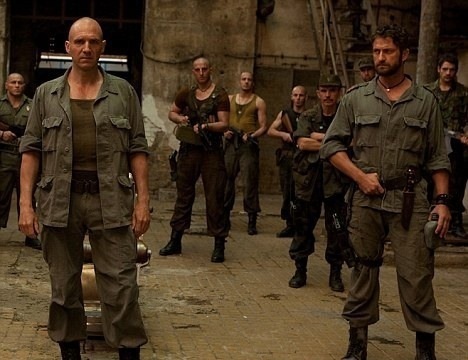 In a war ravished modern state calling itself Rome, where the people and the military have taken to the streets, hero General Caius Martius (Ralph Fiennes) is set to become the leader of the republic. Opponents across the political scale have other ideas though and attempt to orchestrate his downfall and banishment. Once exiled, the furious General forms an alliance with former nemesis Tullus Aufidius (Gerard Butler) and returns home, intent on taking revenge on the city that has scorned him. Despite the modern alternative setting that Fiennes chooses for his adaptation, he still manages to retain the feel of a play. Some scenes reflect a classic BBC dramatisation and he employs some high quality actors to provide the goods. The classically trained actress Vanessa Redgrave is the most comfortable amongst the ensemble as the influential matriarch Volumunia. She delivers her lines with absolute confidence and such an understanding of Shakespeare’s iambic pentameter. She’s not alone though; for as little time as they get, the ubiquitous Jessica Chastain delivers a reserved performance as Coriolanus’ disconsolate wife Virgilia and Gerard Butler proves that his talents lie beyond mere rom-com’s and mindless action movies as Aufidius, the rebel leader of the Volscian army. Butler’s fellow Scotsman Brian Cox also shows some real presence in one of his better roles of recent years as the Roman senator Menenius. 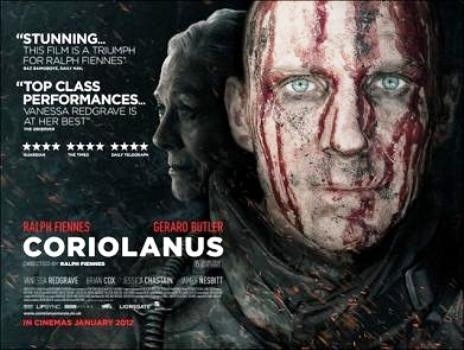 But as the tortured and unrelenting protagonist Caius Martius Coriolanus, it’s Fiennes that takes centre stage, chewing it up in the process and delivering an intense and ferocious performance. It’s often forgotten how good an actor Fiennes really is but this is proof, once again, that given some meaty material, he can really sink his teeth into it. Shakespeare’s works tend to be all about the prose and the performers and as much as this film delivers on that front, it also delivers an effective modern setting with surprisingly brilliant action set-pieces. There is a real intensity to the politics involved and Fiennes wisely chooses to stick with the original material. It’s hard to balance Shakespeare’s writing’s in a contemporary way and for the most part, it works impressively. However, as the original play is based on a supposed Roman general during the 5th century BC, there are regular references to the common beliefs of this time. “The gods” is an often used piece of dialogue that doesn’t quite fit with the chosen setting and whenever the actors deliver lines with such, it jars slightly. The rest of the film though, is a towering and mesmerising take on the machinations and intrigue of political power. As always with Shakespeare, it takes a while to tune your ear but the visuals are so effective and the performances so good, that it brings one of his lesser known tragedies, comfortably, to a wider audience. It also heralds the arrival of exemplary actor Ralph Fiennes as an exemplary new director. This entry was posted on June 4, 2012 at 10:21 am and is filed under Drama, thriller, War with tags 2011. You can follow any responses to this entry through the RSS 2.0 feed. You can leave a response, or trackback from your own site. Great review. Glad you like the film. I really responded to this picture even after a second viewing. Thanks Keith. I’m a big Shakespeare fan, so I expected to like it. I’m looking forward to a second viewing, I think it can only get stronger. Fiennes was absolutely superb – in front and behind the camera. Even more reason for me to head to the Red Box and grab this. I have been wanting to check this out since I first saw the trailer but this did not play anywhere near us. Thanks Adam! If you enjoy a bit of Shakespearian stick then this should appeal. I’m an avid fan and reader of the bard, so it was unlikely I wasn’t going to enjoy this. Most of his adaptations tend to be good and you can’t go wrong with the great cast. Haha. Yeah, it was a good film. I was a bit disappointed that Jessica Chastain and (your) Gerry were a bit underused. They were very effective whenever on screen though. Cox as well was superb. I don’t think he’s from Glasgow, I think he’s from Dundee but he sponsors a Glasgow drama studio that my daughter attended last year. Brilliant actor and he still remains my favourite Hannibal Lector. Your right in saying, that it’s a disgrace he’s never been awarded (or even nominated) for an Oscar. Oh yeah, I wish those two had been on screen more, but at least they were both good when they do appear. That is SO cool that your daughter goes to a drama studio that Mr. Cox sponsored! So is she an aspiring actress then? Yes, he’s my favorite Hannibal Lector too, I just saw Manhunter and I wish he had stayed on to star in Silence of the Lamb! He’s not as ‘flashy’ as Anthony Hopkins but just as terrifying, if not more. Yeah, my daughter likes to perform but I’m not really sure if drama is for her but we like to provide the opportunity for her. She’s got a few drama classes in the summer with the Citizens Theatre in Glasgow, it’s quite an old and reputable theatre that has had some well know actors play over the years. if she doesn’t take to it then at least we tried. I totally agree on Cox’s Lector. He far more understated and chilling. It must piss actors off when another fills a role they have played and go on to win awards when really they deliver nothing better. Best of luck to your daughter, whichever path she chooses to take, Mark. Oh yeah, I’d think Brian might’ve been miffed that he wasn’t offered the role again. I don’t get it why studios do that, unless he himself refused the role. I feel the same way about Timothy Dalton as Bond, as people know give all the praises to Daniel Craig for being a no-nonsense, gritty Bond whilst Dalton originated that style of Bond in the first place but people just weren’t ready for that yet after Roger Moore’s style which is more mischievous. You’re probably right there about Dalton Ruth. I never gave that much thought. I was also critical of Dalton but you have a point. Actors are renowned for being competitive, so it must piss them off. Great review! Planning on seeing this soon. Can’t resist that cast! Cheers man. It’s well worth a look. I was unaware of this one until a theatrical preview (I think before Hunger Games, oddly enough) and I was blown away by it. I hope I get to see it soon, your review makes me want to watch even more. Cheers Andy! It’s a great film. I think the modern settings of Shakespeare’s stuff work really well and this is one of the better ones. Great review Mark. Although I got less from the film when I saw it last year at a festival. I enjoyed it, but I found it slightly indulgent of Fiennes, and he would have been better in the smaller role that Butler held. A bit like Dennis Waterman, wrote the them tune, sang the theme tune…. I am probably wrong though as I know very little about this kind of stuff. I am a poor un educated fool with rubbish taste in film!! Thanks very much Scott. Glad to see you here. I have to admit though, I really liked Fiennes in this but you have a point. I think this could have worked just as well if Fiennes and Butler swapped roles and it would have looked much better on Fiennes’ ego if he took a step back. I can hardly fault the film though. I love Shakespeare and I loved this. I just noticed that it’s for rental in the one remaining DVD rental store in my city, so I expect to be watching it soon. I’m a fan of Ralph Finnes and tend to like Shakespear adaptations, so that makes for a good setup. Oh and I have no shame at all about watching adaptations without having read the play. It’s a good movie though. I really liked it. Cool review, some excellent actors in this. I need to see this. Cheers Vinnie! I’m a Big Shakespeare fan and this was one that I hadn’t actually read but it’s was great regardless of my familiarity with the material.